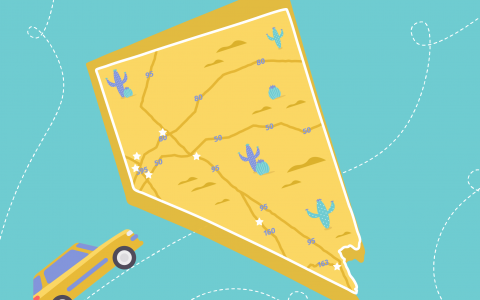 We covered the Golden State, now welcome to the Silver State: Nevada. Nevada stands apart from other legal states for its arid desert landscape and wild attractions. This is a southwestern state marked by a vast desert and hidden delights. From Lake Tahoe to Valley of Fire and Red Rock Canyon, there is so much stunning nature to explore in Nevada—but that’s only the tip of the iceberg. Featuring two robust cities, Las Vegas and Reno, “bored” is not a part of the lexicon. Entertainment is bountiful, with concerts, standup comedy, acrobats, casinos, and more just waiting to be explored. Nevada is a melting pot of culture, making it vibrant and full of life with delicious food to boot. Its location is also unique—bordering California, Utah, Arizona, Idaho, and Oregon, it’s a prime spot for explorations to surrounding states. What’s the deal with the green in Nevada? Cannabis is legal for adults 21+, who can purchase an ounce of flower or an eighth of concentrate at a time. Dispensaries are plentiful in cities like Reno and Las Vegas (which hold 80% of Nevada’s population), so sticking around a larger town is the best bet for being close to the pot shops, though some of the smaller towns are home to dispensaries. If you end up far from a dispensary (25 miles or more to be exact), then you will be legally permitted to grow up to six plants, with a total household limit of 12. Those who live closer to dispensaries are not legally allowed to grow, and while dispensaries offer plenty of convenience and variety of product, it is worth noting that currently, prices remain on the higher side. Nevada also has plans to open cannabis lounges, projected for some time in 2019, but nothing is finalized just yet. While Nevada may not have the most relaxed laws in terms of growing or the best prices in the country, it is unbeatably unique. It is still a fine contender as a potential homestead due to its incredible geography, vibrant communities, and stellar herb.